Alexander Johnson was a Scottish painter. He was known for his genre and history painting. He was born in Edinburg. His father was an architect. Alexander was kept with a seal engraver at the age of fifteen. Alexander studied at Trustees Academy from 1831- 1834. He was introduced to Sir David Wilkie when he came to London. He entered the schools of The Royal Academy with Wilkie’s recommendation. Up to 1836, Alexander was under H. Hilton. 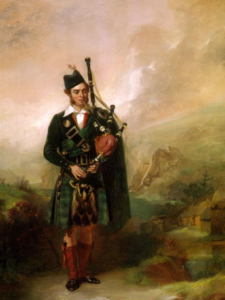 He devoted himself to portrait painting when he was in Edinburg. When he came to London he brought Dr. Morison’s family portraits. He exhibited them at Royal Academy in 1836 and 1837. 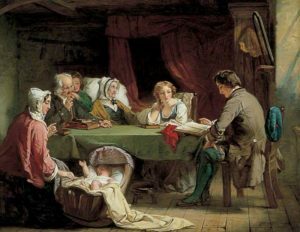 ‘The Mother’s Prayer’ was his first subject picture which he exhibited in 1838. He sent his ‘Scotch Lovers’ to the Society of British Artists. 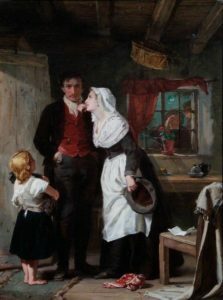 He gained favorable notice for his work ‘The Mother’s Grave’ at Royal Academy in 1839. 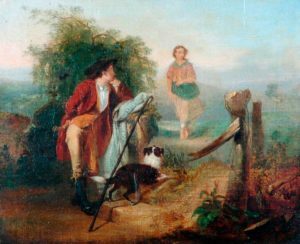 His popularity was established with ‘The Gentle Shepherd’ in 1840 and ‘Sunday Morning’ in 1841. 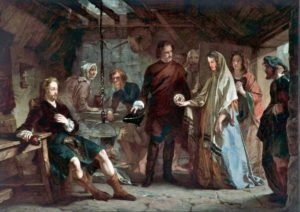 He exhibited his first historical pictures ‘The Interview of the Regent Murray with Mary Queen of Scots’ in 1841. The Edinburgh Art Union purchased this. He exhibited largely in the Paris Exhibition in 1878. This gained him a lot of attention. 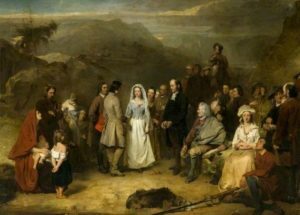 He was awarded by the Glasgow Art Union a premium for ‘Prince Charles’s Introduction to Flora Macdonald after the Battle of Culloden’. He declined this award. 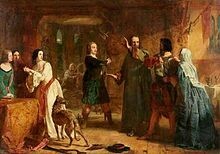 Robert Vernon purchased ‘Archbishop Tillotson administers the Sacrament to Lord William Russell in the Tower’ in 1845. This work became a part of the Vernon Gallery. 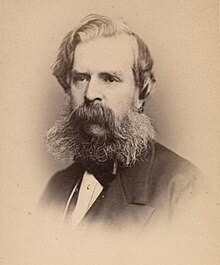 His other works are ‘The Covenanter’s Marriage’ in 1842, Tyndal translating the Bible’ in 1854, ‘John Bunyan in Bedford Jail’ in 1861, ‘Juliet’ in 1870, ‘The Turning Point’ in 1873, ‘Tired’ in 1874, ‘Ought I do It’ in 1875’A waif’ in 1877 were to name a few. Alexander’s ‘The Figure II Penseroso’ in 1870 was at the Royal Academy. This is about a nun in stately and dignified form, who has walked forth in the evening twilight and stands fixed in contemplation of the heaven. His compositions were sound. His drawings were accurate. Alexander’s work was not lacking in poetic force and in sterling character. His works rarely expressed happiness and joy. They mostly focused on the pathetic and sad side of nature. However, the expression of features was considered very severe. His work had some amount of stateliness. This made him a strong and powerful painter. Alexander was a regular contributor to all the principal exhibitions, in later years. He was an exhibitor till 1884. Douglas Johnson, his brother was a musician with loads of talent in Glasgow. However, his brother died before him. Alexander died after a short illness on 2 Feb 1819 at Hampstead.